Las Vegas (the Meadows or grassland) was a name given by the Spaniards who used water in the area while heading north and west along the Old Spanish Trail from Texas. In the 1800.s areas of Las Vegas Valley contained artesian wells that supported extensive green areas or meadows.John Freemont travelled into the valley in 1844 when it was still part of Mexico. He was a leader of a group of scientists, scouts and observers for the U S Army Corps.In 1855 following the annexation to the U S, Brigham Young sent 30 Mormon missionaries to convert the Paiuti Indian population. A fort was built near the current down town area, serving as a stopover for travellers between Salt Lake City and a colony at San Bernardino, California.Las Vegas established itself as a railroad town in 1905 when 110 acres were sold off. 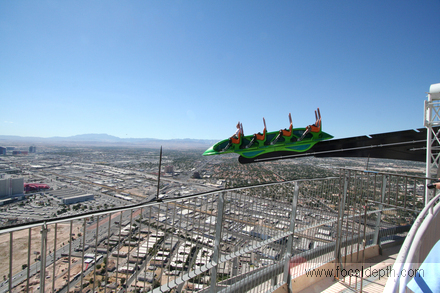 "X Scream" is a thrill ride in Las Vegas on top of the Stratosphere 866 feet above the ground. Even more scary though is the fact that you climb into a seat on the eight seater car and hoisted high in the air before being shot along a track extending 27 foot over the edge of the tower. The track dives at a 30 degree angle reaching speeds of 30 miles per hour, when the car jerks to a sudden stop at the end of the track....and there is nothing much between you and the Strip 900 feet below.